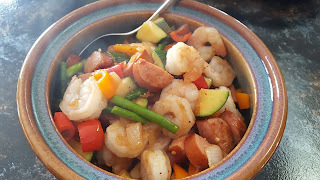 I'm always on the look out for fast, easy and delicious meals - they are a life saver on weeknights, especially busy weeknights that involve sports practice, music concerts, and who knows what else. When you have less than an hour to cook AND eat, you have a bit of a challenge. But this is one of those recipes that comes to the rescue! And it only dirties one pan. Save the dishes for after the concert! I added more meat and vegetables than the original recipe, so I ended up using my large electric skillet so that everything could cook evenly. It worked like a charm. And the best part? It's tremendously versatile - use your favorite veggies or the ones that are languishing in the fridge. I loved zucchini and asparagus together but I'm sure there are many other combinations that would be equally great. 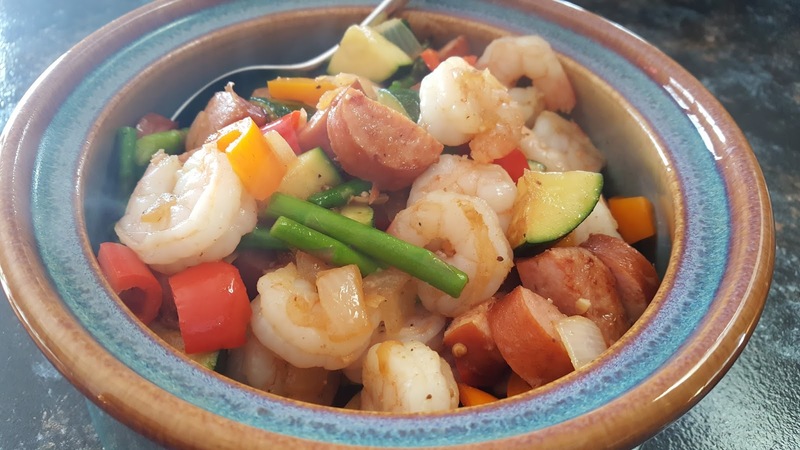 Quickly chop up the veggies and sausage, thaw the shrimp, and you'll have a really delicious dinner on the table in no time. Find more great ideas at Inspiration Monday, Busy Monday, Inspire Me. 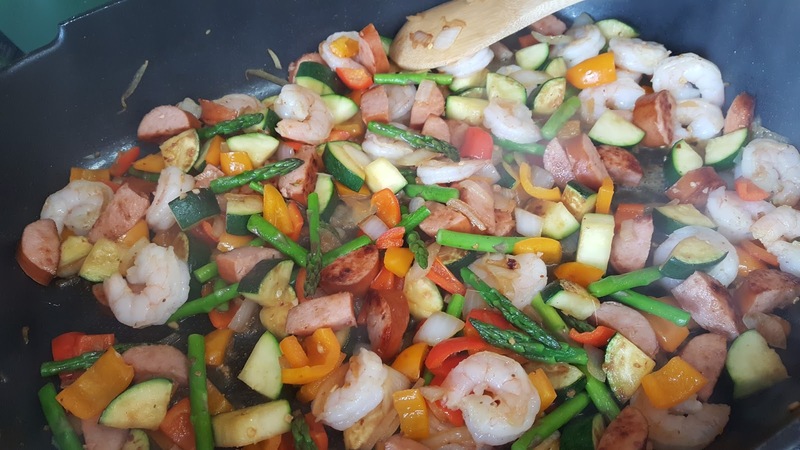 Heat a large skillet over medium-high heat (or use a large electric skillet at 350) and add coconut or olive oil. Season shrimp with Old Bay seasoning and set aside. Cook onions and bell peppers in skillet with for about 2 minutes; add sausage and zucchini to the skillet, cook another 2 minutes. 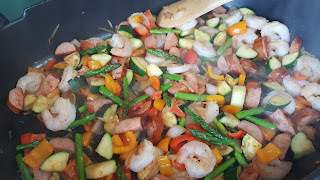 Add shrimp and asparagus into skillet along with the garlic, and cook for 1 minute, then add chicken broth mix well to moisten all the vegetables. Salt and pepper to taste, and sprinkle with red pepper flakes. Serves 6.